The Russian Prime Minister said sanctions against the country by the West are unproductive. Speaking at the opening ceremony of the Sochi Investment Forum, Russian Prime Minister Dmitry Medvedev said his country will continue its economic reorientation towards India, China and Japan. Medvedev acknowledged the grim state of relations between Russia and the West. "This year will enter history books as a turning point, as a point of reference for the new age in which the war in Ukraine began, Crimea returned to Russia and sanctions were imposed against our country," he said. The prime minister added that the cooling of relations with the West had forced Russia to review the position it had occupied until now. “We have the feeling that many of our western partners no longer consider the fact that Russia has its own interests. As a consequence, the entire idea of the world's evolution after World War II has been subjected to doubt," said Medvedev. Medvedev pointed out that in the last century there had been many occasions on which sanctions were introduced against Russia. "There are different opinions of the Soviet political system, but we were able to overcome the sanctions," said Medvedev. "In 1981 the U.S. stopped supplying materials for the Urengoy-Uzhgorod gas pipeline, but it was built nevertheless. Then in 1998 the U.S. introduced sanctions against scientific institutions that were suspected of collaborating with Iran. History demonstrates that all attempts to pressure Russia have been futile." According to the prime minster, pressure even on relatively small countries proves to be futile, whereas the Russian economy is the sixth in the world by parity. "We should look the truth in the eyes: Opposition with sanctions is something negative, for us and for the West. We are experiencing losses, but no one is able to predict how the sanctions will reflect on the world economy," added Medvedev. In Medvedev's view, the current situation is different from the 2008 crisis because during the last economic crisis all the large world economies worked together. It was precisely in that period that the G20 was created, an institution that united very different countries. "This was the guarantee of success. We are still willing to listen to our partners on the condition that they learn to take our interests into consideration," he said. According to the Prime Minister, European countries are still the leading investors in the Russian economy, with an investment volume of about $300 billion. In the near future the Russian economy will continue reorienting itself toward Asia, Medvedev continued. "Russia's convergence with Asia is an objective process. We started it almost 10 years ago. It involves collaboration with all the countries: China, India, Japan, as well as with countries that have smaller economies." According to Medvedev, in the fall of 2014 Russia's State Duma will be presented with a bill on the creation of 14 advanced development territories with preferential fiscal regimes in Siberia and the Far East, which will be oriented mostly towards Asian investors. Other types of collaboration with Asian countries will be the development of infrastructure projects, primarily the enlargement of trans-Eurasian railway corridors: the Trans-Siberian and the Baikal-Amur railways. The general investment volume in the projects will exceed 500 billion rubles ($13 billion). "Our new strategy in Asia is not to meaninglessly take revenge on Europe. It is a natural evolution of events. Yet, we cannot exclude the fact that the strengthening of our country in the region will augment our authority in other parts, including in Europe," Medvedev explained. According to the prime minister, collaboration with Asian countries will take place against a backdrop of worsening Russian economic indicators. In the first eight months of the year, Russia's GDP grew by 0.7 percent. In 2014 GDP growth will be 0.5 percent, while in the last five years it had been growing at one percent a year. From January to August 2014 investment in real capital was reduced by 2.5 percent, yet industrial production grew by 1.3 percent. "Agriculture is developing faster than other sectors of the economy: In eight months of production it grew by five percent," said Medvedev. "Unemployment is steady at 5 percent; last year it was 5.7 percent. We have been able to preserve a rather large volume of gold-currency reserves. We were expecting a more substantial economic recovery, but the changes in the external economic situation forced us to change our forecasts." Inflation is an annualized 7.8 percent, but some experts believe that this is a combination of structural, cyclical and external economic factors. 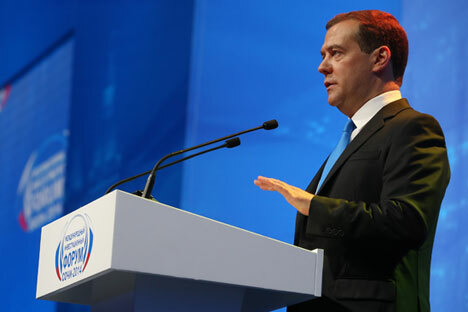 "Any government would have been tempted to blame the external economy for the difficulties," said Medvedev. "We have a series of structural problems. We will continue working according to all these parameters. Our priorities will not be changed." In his words, despite the negative economic indicators, the Russian economy will not be a closed one: "We will not change our course. We will maintain the particularities of the flexibility of the national currency's exchange rate and the targeting of inflation. All this remains unchanged."